Are you a mature individual who has previous wildfire experience? Do you communicate well under stressful situations? Can you motivate a dynamic group of individuals while fighting wildfires or during projects? Are you physically fit? Are you able to function in a team environment while displaying independence? If so, a Man-up Supervisor may be the right opportunity for you. 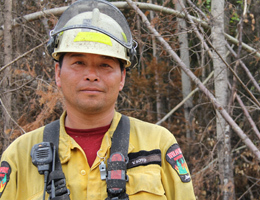 As a Man-up Supervisor, you will be responsible to supervise Wild Fire Crews (WFC) while on man-up working on various projects. When dispatched to a wildfire, you may be required to perform the function as an Incident Commander to manage the incident while supervising several Wild Fire Crews and other incoming resources. On larger incidents, you may be required to perform the function as a Division Supervisor, supervising up to 56 Wildland Firefighters while under the structure of a Type 1 or Type 2 Incident Management Team. High school diploma plus one year related experience. Certificate of Proficiency in Radio (Aeronautical) from Industry Canada. Previous wild fire experience preferable working as a Leader or Sub-leader on a crew. Forest Technology or Natural Resources education considered an asset. Completion of the Operations Section course at the Hinton Training Center. Strong organization and writing skills. Obtain daily project or wildfire assignments complemented with a safety briefing to address all anticipated working conditions and potential hazards to ensure worker safety under your supervision. Act as a mentor and trainer to enhance WFC knowledge base, skills and abilities. Effectively communicate with the Duty Officer and WFC to effectively complete tasks and assignments in a safe and timely manner. Complete all administrative duties with accuracy and meet deadlines. Complete all operations in accordance with Departmental Policy & Sop's, Occupational Health and Safety Acts & Regulations and Financial Policy & Business Rules. Participating in supporting the Wildfire Detection and Wildfire Prevention programs. There are meals and accommodations provided at most of our primary and secondary fire bases within the province which is available during length of employment. At this time, there is no cost for this subsistence at these facilities. Based on Area and hazard, normal shifts could range from 5/2, 10/4 or 15/6. When active on wildfires, you may be expected to work up to 18 or possibly even 24 days pending urgency and need.